This 5 minute Maia apple pie parfait is perfect for a quick meal, snack, or desert! Put chopped apples, a pinch of brown sugar and cinnamon in the microwave for 2 min. 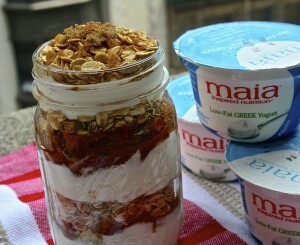 Take your Mason Jar and layer with Maia plain yogurt and your favorite granola or quick oats and voilà!